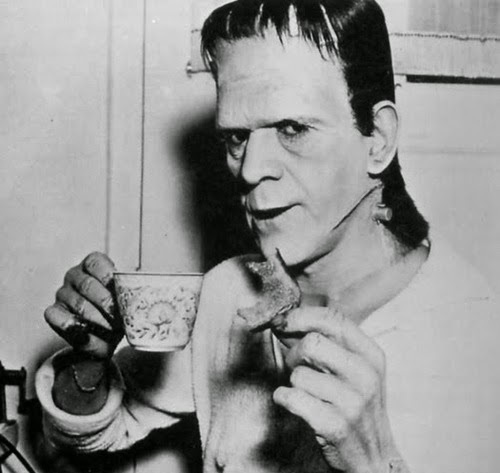 Boris Karloff Takes a tea break. Is Key Stage Three a tea break, a preparation for GCSE or an educational adventure? I was chatting to an English teacher the other day who told me that in her previous school they were required to teach Frankenstein at A level, at GCSE, which they taught over three years from year nine, and in year 7 and 8 they were asked to ‘introduce Frankenstein’ though the use of drama. The whole experience at this school and, I accept the teacher might have been exaggerating, seemed to have been set up with exam results in mind rather than the broad education of the pupils. This got me thinking what is the point of Key Stage Three? Why not go straight into GCSEs? After all that is what the school is being measured against: good GCSE results are a sign of good teaching, a good headteacher and a good school to attend for good pupils of good parents in a good area, so why not teach GCSEs from day one? Well, some people might object and say: ‘some children aren’t ready for GCSE classes yet’ but that is not an argument against teaching GCSEs that is an argument for teaching them in ways suitable for younger children and repeating the knowledge in more complex ways as the pupils develop. Some people might say: ‘but there’s a national curriculum with which we must comply,’ until it is pointed out that many schools have the freedom to ‘ignore’ the national curriculum and teach as they see fit. So why not make every day of school a Groundhog Day of ‘if it’s English it must be Frankenstein Day’; why not just teach the stuff that the school is mainly accountable for? One can appreciate the thinking behind the idea of EBacc Groundhog from year seven, especially for, you know, those kids who are a bit… er, how do you say… ‘less academic’…? Why not do it? Because it is limiting the pupils’ education to a frustrating round of bits of the body of a single limited course in a reduced number of subjects that does not count as a broad education. OfSted realises the problem and is urging Headteachers to do more to boost their school’s provision at this crucial time in a child’s education. Key stage three is an opportunity to open up the conversation, to introduce pupils to a wide range of subjects, disciplines, arts, voices, experiences all for their own sake and without the dreaded need to assess them to within an inch (a centimetre?) of their free thinking lives. This is not an excuse for a ‘tea break’ approach where it doesn’t really matter what you teach, key stage three should have its own worth – education for its own sake. And sometime between the ages of eleven and fourteen, when a child is ready, have an ‘all must pass test’ of basic skills and knowledge in ‘numeracy and literacy’ which will show that a pupil has a good grasp of the basic knowledge required to be able to function independently whilst studying a vast array of other subjects through which they might be able to flourish. “education for its own sake” – Wouldn’t that be nice?